Expressing anguish over the situation in the Jammu and Kashmir, he said the state is going through great "turmoil" and the turmoil does not seem to end. 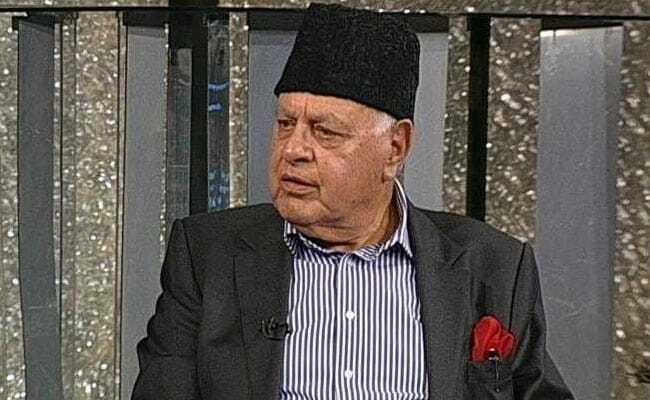 Farooq Abdullah also advocated talks with Pakistan for restoration of peace in the Kashmir Valley. National Conference leader Farooq Abdullah on Friday questioned in the Lok Sabha the Jammu and Kashmir Governor's decision to dissolve the state assembly. Voicing concern over the situation in the Kashmir Valley, he also advocated talks with Pakistan for restoration of peace. The former Jammu and Kashmir chief minister made these remarks while participating in the debate on the statutory resolution for proclamation of President's Rule in Jammu and Kashmir. Referring to the proposed National Conference-Peoples Democratic Party-Congress alliance to form government in Jammu and Kashmir, he said, "The fax machine of the J&K governor was not working, his phone was not working and I would like to say that Governor's House is not the place to prove majority but the assembly is. Governor didn't wait and dissolved it." "The solution to the problems of the state is not through the police and the Army. The unfortunate killing of civilians needs to be stopped, it further worsens the situation. Something has to be done immediately," he said. Advocating talks with Pakistan, Mr Abdullah reminded the ruling BJP of former Prime Minister Atal Bihari Vajpayee's remarks that "we can change our friends but not our neighbours". "For peace...we have to find some way of talking to the neighbouring country (Pakistan)," he said. "For the sake of India, Kashmir needs to be given priority. The state has been suffering a lot. It can suffer more. I urge all of you here to please help us get the state back to normal," he said.